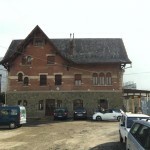 May 2014 – In Italy, the Turin Transport Group (GTT) has undertaken an important renovation project, in conjunction with the infrastructure management body Infratrasporti.To, to restore several railway buildings within the province of Turin. 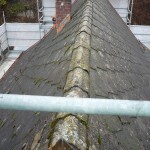 This sensitive project involved the removal of asbestos fibre cement roofing in six regional stations. 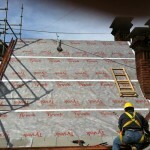 The recently completed project substituted the original roof structures with sustainable solutions offering superior energy efficiency, including DuPont™ Tyvek®, an advanced breather membrane that is unique in the market due to its high-quality single layer construction. Architect Fabio Bolognesi, project director and safety coordinator for Infratrasporti.To, was responsible for preserving the historic, aesthetic and architectural value of the buildings, while assuring a sustainable and energy efficient renovation. 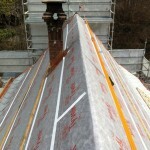 Initially the refit involved only the elimination of the asbestos elements, but the architect ultimately decided on a more radical intervention to the entire roof systems. 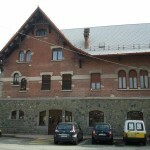 To preserve the architectural characteristics of the buildings, the restoration included the repair of original decorative timber elements and paneling, as well as the replacement of obsolete roof tiles with aesthetically identical alternatives made from asbestos-free, ecologically sound materials. Such measures contributed to full approval from the regional governing bodies that regulate the preservation of heritage environments. 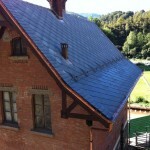 To provide a superior level of protection and energy efficiency to the buildings, DuPont™ Tyvek® high-performance breather membranes was specified for application prior to the installation of new the sustainable fibre cement roof tiles. 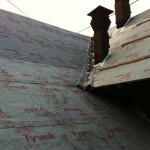 DuPont™ Tyvek® is very easy to install and highly suited to pitched roof systems, offering proven reliability. Impermeable to air, water and dust but providing naturally superior vapour diffusion, the membrane acts as a barrier protecting the building from damage due to condensation and atmospheric agents. Improving structural airtightness and moisture management when correctly installed, DuPont™ Tyvek® enhances interior comfort and reduces heating or air conditioning costs. Furthermore, the membrane is extremely resistant to damage, thus protecting the structure both during the construction phase and optimising energy performance for the long term. DuPont™ Tyvek® is consists primarily of high density polyethylene (HDPE) polymer without the use of plasticizers or restricted chemicals as listed in European Directives, therefore making no hazardous emissions. 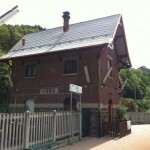 Its application to the station buildings of the Torino-Ceres railway line is fully aligned with the key objectives of sustainability, low environmental impact, and respect for the architectural heritage guiding the entire project.